There's a new way to heal in town, and all you'll need is your nose and some pretty scents. Aromatherapy — the practice of deeply inhaling essential oils to improve mood and well-being — has been around since the ancient Egyptians and Greeks, it's just recently creeping up in Western medicine. As an alternative treatment, it's gaining traction in the science community, too. Turns out your nose and brain are very connected. Here's how it works. When you breathe in a scent, you stimulate receptors in the nose, which send messages via the nervous system to the part of your brain that handles emotions. Certain aromas trigger sections of the brain that correspond to certain feelings such as calm, energized, or focused. Research found that aromatherapy can also change the immune response, helping dial down on inflammation in the body, and in turn helping ward off stress, viruses, and illness. Ready for a whiff? Here are five essential oils that help you smell away your well-being woes, from Hope Gillerman, aromatic healer and creator of H. Gillerman Organics. 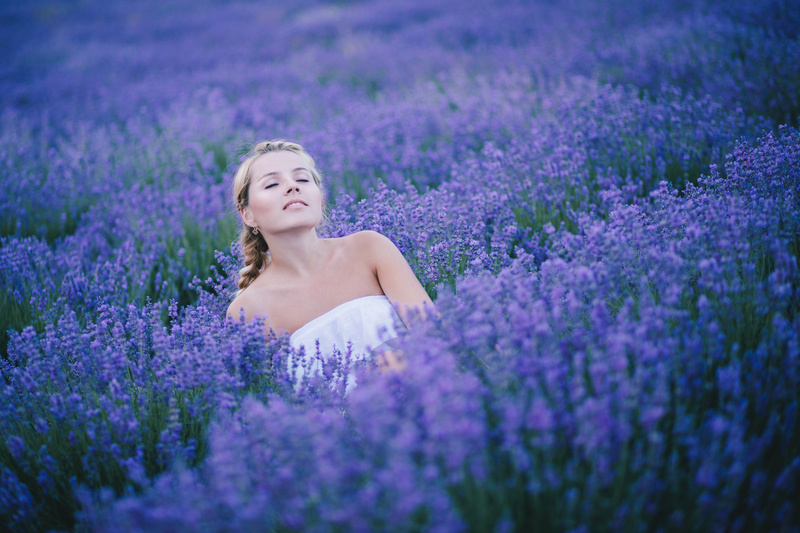 When you're feeling frazzled, you most likely reach for lavender. Research found it can lower stress levels and even reduce pain, but it's not the only scent that curbs anxiety. "Citrus oils like blood orange, tangerine, and mandarin orange are nature's antidepressants. They reduce stress, improve mood, and even enhance digestion," Gillerman says. To max out the benefits, place one drop on wrists, temples, and the inside edges of the eyebrows, as often as needed. Peppermint tea has long been a soothing remedy used to banish indigestion and nausea. The essential oil, however, packs in more of a kick. "Dropped on the back of the neck, it can relax muscles and relieve mental fatigue, so you actually wake up the senses," Gillerman says. Use it up to five times each day. Forget your mid-afternoon latte. This herb can hike up productivity, helping you tackle those lingering spreadsheets or brainstorm for a new project. "Basil rolled onto neck and shoulder muscles helps power up brain function by strengthening memory, improving concentration, and upping resolve," Gillerman says. Drop onto upper limbs during your morning shower to score laser-sharp focus. The potent scent of this botanical will snap you out of the sniffles. "It's anti-viral, anti-bacterial, and detoxifying," Gillerman says. "Just a drop in each nostril will help decongest and bring the mind back into focus." Your Christmas tree has some health benefits, too. "Pine, spruce, and fir oils deepen breathing and help with coughs because they don't dry out the throat area," Gillerman says. Apply oil on chest, neck, and shoulders in your morning shower, or drop into a warm bath at night for super quick relief minus the oh-so-unpleasant cherry cough medicine.